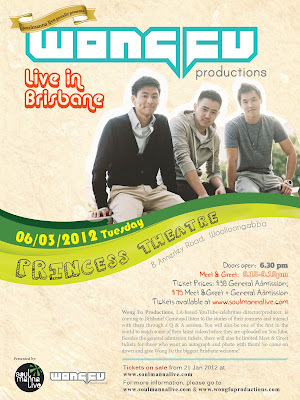 mz D i D i: WONG FU IS COMING TO BRISBANE!!!! *squeals* I got SO excited when I read this on their facebook status update! Wong Fu is coming to Brisbane!!! I couldn't believe it! Usually it's just Sydney that gets everything (i.e Kpop Concert but that's understandable since it was just ONE day) but for Wong Fu to come my hometown is a dream! It was the last thing I ever expected! I REALLY truly want to see these guys. These guys are my inspiration when it comes to film making. Their work is amazing and original and so professional. But I have yet to find anyone that wants to come with me. I'm wanting to do the Meet & Greet but I have a feeling some friends won't come because it's too "expensive" >< Is $75 really unreasonable for Meet & Greet incl. admission ? =( Even if no one wants to come with me, I'm thinking of going by myself! It'll be lonely but worth it! Here's some videos from Wong Fu Productions. Strangers was the first one I ever watched and it really stuck by me...the storyline and how it is so relate able.